Xobni: Outlook Search on Steriods! Download for free at www.xobni.com. We rank Xobni’s Insight as one of the most useful addins available for Microsoft Outlook. 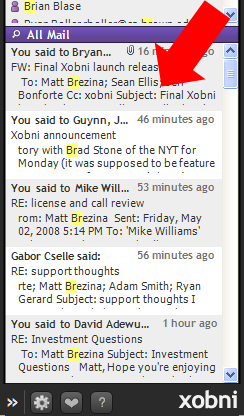 If you’ve never seen Xobni in action it’s very difficult to describe exactly what it does and how it makes a huge improvement in using Microsoft Outlook. Essentially, Xobni indexes all the data stored in your Outlook folders and then provides you with very effective tools for finding and viewing data like emails, attachments, and contacts in ways that Outlook, by itself, does not. Before we dig into some of Xobni’s features it might be helpful for you to understand what happens when you first install Xobni. Xobni is an Outlook addin so, when installed, it becomes a part of Microsoft Outlook and functions within your Outlook interface. 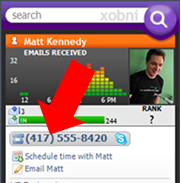 The first time you open Outlook after installing the Xobni addin you’ll see the Xobni sidebar (shown in the illustration below). The first thing you’ll need to do after installing Xobni is to have it index your Outlook data (it will start this process automatically). The amount of time it takes to complete the index will depend on the amount of data you have stored in your Outlook data files. Now, if you are like our staff and millions of other people around the world, meaning you use Outlook all day, every day, then you are going to wonder how you ever did without Xobni. Let’s face it, when you’ve been using a tool like Outlook for years you build up thousands of emails and attachments, hundreds of contacts, and a mountain of other data items that you can’t delete because you just may need them again someday. The problem is how do you find that one thing you are looking for in a quick and easy way? Well, this is one of the things that Xobni does, and does very well. In fact, it does search within Outlook much better than Windows Desktop Search and Outlook’s built-in search feature. Moreover, Xobni goes search several steps further because it gives you results the second you start typing your search(see illustration below). Furthermore, as your search results are retrieved; Xobni makes the Outlook data it finds more functional by presenting e-mail as threaded conversations, by organizing related file attachments, and by extracting and making visible useful information like phone numbers related contacts. 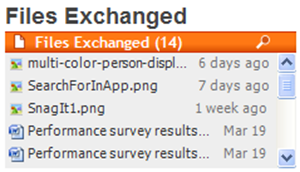 We simply can’t tell you how much time the “Files Exchanged” feature has saved us when looking for an attachment buried deep within Outlook. 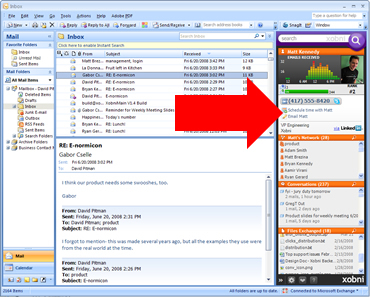 This feature alone makes the product worthwhile, especially for those who rely on Outlook on a day to day basis. A scheduling assistant that allows you to schedule appointments with a click of a button whereby Xobni automatically finds open slots in your busy schedule. An email analytics view that shows rankings, graphs, and statistics detailing how you and your contacts use email. Integration with other popular websites and services like LinkedIn, Facebook, Yahoo! Mail, Skype and Hoovers. Xobni for Outlook free and can be downloaded on the web at www.xobni.com.